Please have you passport open at the photo page ready for scanning. If your passport has this symbol on the front cover then you have a biometric passport and are able to use the e-gates. You can use these if you are British, from the EEX, Switzerland or Liechtenstein and have a new biometric passport. Upon arrival at London Stansted Airport, Passport Control FastTrack allows you access to a dedicated, limited-access queue to Border Force’s passport control checkpoint. Passport Control FastTrack is open 7am - 2am. There are a range of options for parking if you're picking someone up from London Stansted Airport or dropping them off for their flight. 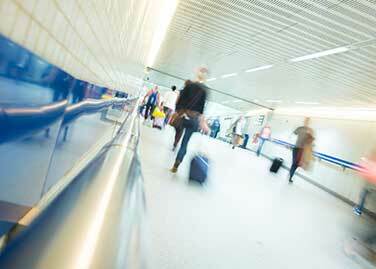 If your journey began outside the EU (your hold baggage will have a white tag), use the green channel. If your journey began outside the EU but you transferred through an EU country before arriving at this airport, use the green channel. When booking connecting flights please ensure that your inbound flight arrives a minimum of two hours before the departure time of your outbound flight. Although you are not subject to passport control, you will need to pass through HM Customs after collecting your baggage. You should go through the blue customs channel, unless you have something to declare to HM Customs. Never bring goods which are prohibited into the UK. If in doubt, ask at the Customs enquiry point. If you are unsure about your duty/tax free entitlement, go to the Customs enquiry point. To find out exactly what you can take through Customs (for the UK or any other country), visit our Duty Free Allowances page. For further information visit the HM Revenue & Customs website or call 0845 010 9000. Baggage trolleys are provided in the reclaim hall and other key areas around the terminal building – please help yourself if you require one. There may be baggage from more than one flight on each carousel so please be patient and try not to block access for others. In the interests of safety, children (or adults) must must not ride on the trolleys. Our integrated public transport hub is a state-of-the art interchange for rail and bus services to Greater London and the surrounding areas. If you’ve parked at the airport, check how you need to pay. Do you need to visit a pay station before you leave the car park? Here is a handy map for London Stansted Airport for the arrivals at the main terminal, so you can plan out your journey. 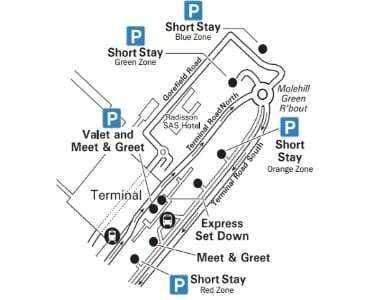 If you are picking someone up from the airport - see where you can park that will guide you to where you need to be.